Our services prove time and time again to be an integral part of the communities we serve. The Distress Centre of Ottawa and Region proudly attends and participates in as many community fairs in our region as possible each year. These fairs provide an excellent forum for the Distress Centre to meet members of the community, to introduce the services we provide, and to offer volunteering opportunities with our agency! From fairs that cater to the 55+ groups, to universities and colleges, and everything in between, we're more than happy to attend your event! If your organization is interested in having the Distress Centre of Ottawa and Region attend your community fair, please fill out our online form and allow our Manager of Media, Marketing and Communications to review your request. 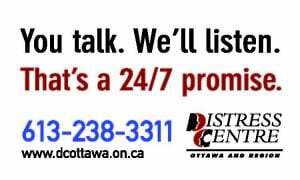 From time to time, businesses and organizations in the community are looking for materials to provide to patients and clients which highlight our 24/7 support services. 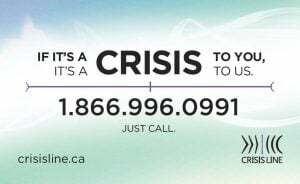 We are always happy to provide materials about the Distress Centre and/or the Crisis Line. Having our phone number and information at people’s fingertips is important to us! Simply fill out our online request form to get started. Please allow up to 10 business days for delivery to occur and at some time periods it may be a bit longer. Materials are provided at no cost to you, however, given that we are a charitable organization, we welcome donations to help offset the cost of printing and shipping of materials. We greatly appreciate the gesture!